Robert Woodhead Ltd is looking ahead to Friday’s Committed to Construction in the East Midlands Awards, with nominations for five awards. Contractor of the Year – to mark the company’s commitment over the past year to its varied programmes of work, the communities it works in, its staff and partners. Committed to Corporate Responsibility – for the company’s relentless charity work, community relations and dedication to providing training and career opportunities to its staff. Committed to Sustainability – for Robert Woodhead’s work with Nottingham City Homes on its £2.85m project to build 26 sustainable family homes and bungalows. Project of the Year – for the company’s delivery of the first phase of the Building a Better Nottingham scheme. 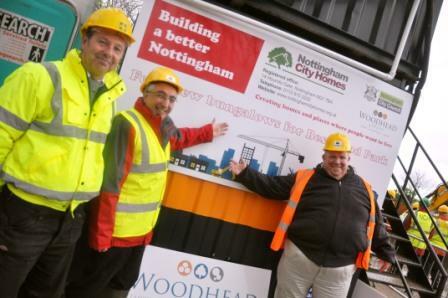 Collaborative Working – for the work carried out in partnership with Nottingham City Homes and Nottingham City Council on the first phase of their Building a Better Nottingham programme. The firm has already been commended nationally by the Considerate Constructors Scheme for one of the sites at Henning Gardens in Top Valley, Nottingham and is also nominated in the Chartered Institute of Housing’s UK Housing Awards at the end of April for its work on the Geraldine Close site in Bestwood, Nottingham.